Right Worshipful Brother David B. Brown was born in Independence, MO as the fourth son of Grand Lecturer Emeritas Stanton T Brown. David grew into manhood in Eastern Jackson County where he resides with his wife Jennifer and four children and three grandchildren who all live in the Buckner area. He is currently the Pastor of Buckner Community of Christ church in Buckner, MO. In the Spring of 1980 RWB Brown was initiated, passed and raised in Buckner Lodge #501 where he served as Master of the Lodge in 1985. David spent the next several years raising a young family and investigating other Masonic-related organizations. 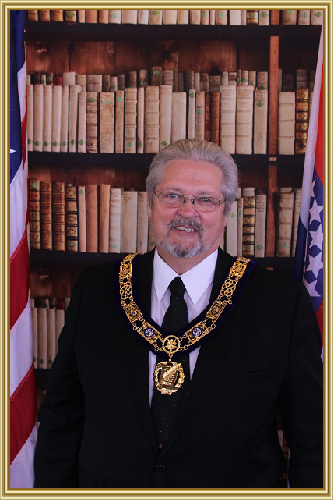 In 2011, RWB Brown was appointed as Chairman of the Missouri Grand Lodge Masonic Education Committee where he has served for the last seven years and still holds that position today. In addition, RWB Brown serves as Secretary and Lodge Education Officer for his home lodge. He also belongs to various other affiliated organizations such as the Buckner Chapter #280 Order of the Easter Star, Independence Royal Arch Chapter #12, Independence Council of Cryptic Masons #49, Palestine Commandery #17 of Knights Templar, Kansas City Valley of Scottish Rite Masons, Kilwinning Council #19 of Allied Masonic Degrees, Charlemagne Council #79 of Knight Masons, Mary Conclave Red Cross of Constantine, Missouri College of Rosicrucians, and The Royal Order of Scotland.